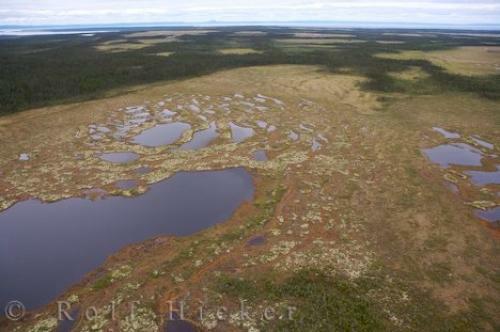 From an aerial perspective, the boggy landscape of Southern Labrador is that of large pools of water and soaked grassland interspersed with patches of forest and low lying shrubs. The landscape of Southern Labrador between Happy Valley-Goose Bay and the cool Atlantic Ocean is made up of a biome called taiga, which is a type of habitat. Some of the typical wildlife species of this region of Southern Labrador are Black bears, caribou, lynx and fox which, when lucky, can be seen from the air during a flight above the diverse landscape. Aerial view of the bogs in the wilderness of Southern Labrador, Labrador, Newfoundland Labrador, Canada. interior of Southern Labrador, Canada.